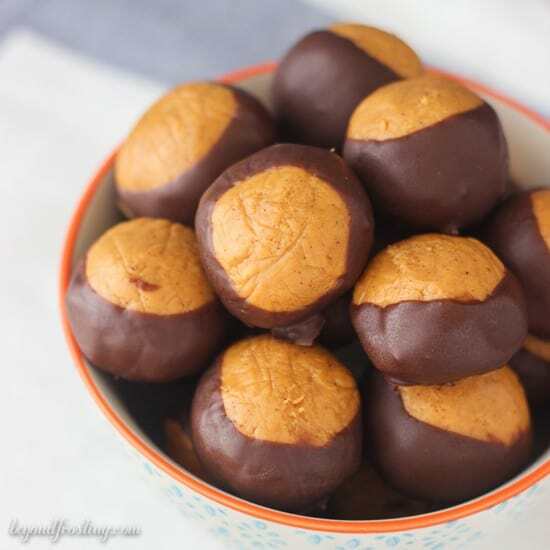 These Pumpkin Spice Cookie Butter Buckeyes are a wonderful twist on a classic peanut butter buckeye. I know what you might be thinking right now, “what is she doing posting a pumpkin spice recipe? Does she not know it’s December?” Yes, I know it’s December, but I simply can’t wait until next year to share these with you. Let’s not ignore the fact that buckeyes are one of my favorite Christmas cookies to steal off the table. So there’s that. 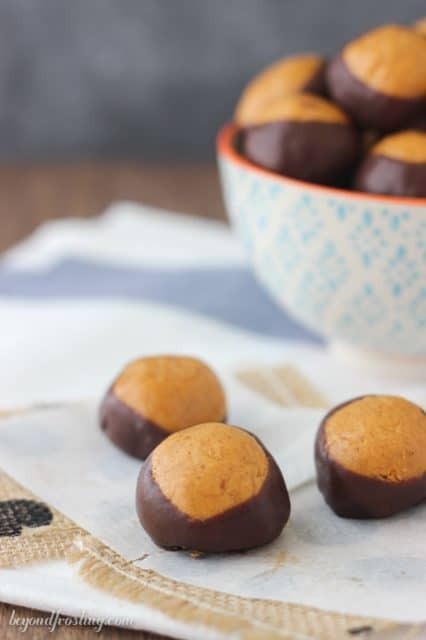 I am loving these Pumpkin Spice Cookie Butter Buckeyes! When I made them, I froze them for awhile and I was sneaking them every so often. Here’s the catch though: you have to buy the Pumpkin Spice Cookie Butter at Trader Joes. Once I saw that someone has Instagrammed a photo of the cookie butter flavor, I pretty much immediatly went to TJs. It is SOOO addicting. I am a cookie butter fan, but once you throw in the pumpkin spice, it’s like WOW. Can we talk about the term buckeye for a minute? This caused the Great Debate of 2015 in our household and even extended over to work. 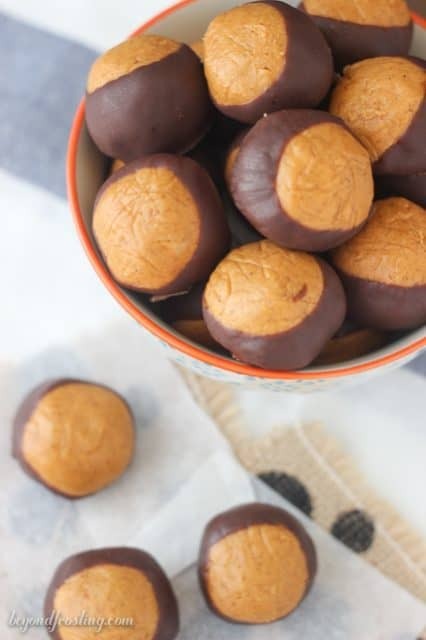 I grew up calling them buckeyes (you know, peanut butter balls), but my boyfriend has never heard of it and thought I was cray cray. So I started talking to my coworker (who is also from California) and he didn’t really know what I was talking about. So he asked his family at dinner and it caused a debate amongst them as well. Then, I mentioned it to my coworker from Ohio and she was all, “oh yeah, I LOVE buckeyes”, and I deemed myself the winner. Buckeyes are a thing, end of story. Anyhow, let’s discuss a few tips to making these successful. 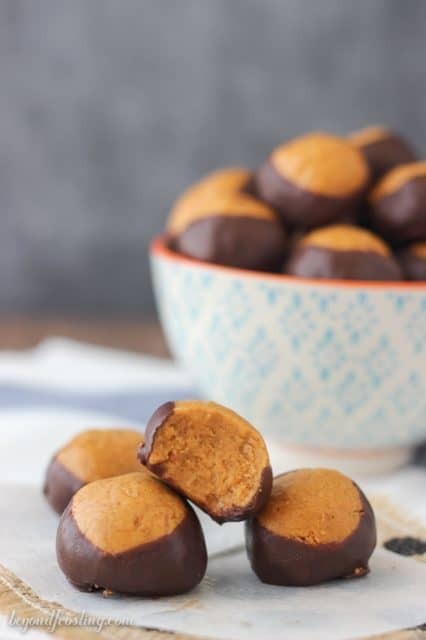 Freeze the peanut butter balls before dipping them in chocolate. This helps keep them together. Most people use a toothpick to dip and swirl them in the chocolate, but I prefer to use the fork method. I placed the peanut butter ball on the fork, and dip it into the chocolate, and then gently tap the fork on the edge of the bowl to drip off excess chocolate. To get the peanut butter ball off the fork, I use a flat edge knife or a toothpick to nudge it onto my cookie sheet. The chocolate is an important component. I prefer dark chocolate myself. When I melt the chocolate, I melt it together with vegetable shortening. This helps thin out the chocolate to make it perfect for dipping. I dipped them in batches; I took 5 out of the freezer at a time and dipped them. After a few batches, I put the pan in the refrigerator to help the chocolate firm up. If you leave them on the counter (before dipping), the peanut butter balls will soften too much, so move quickly. These buckeyes would make a great gift, but it’s unlikely that all of them will make it out unharmed. Soften butter in the microwave for 15 seconds. Butter should be softened but not melted. Beat butter on medium speed light and fluffy. 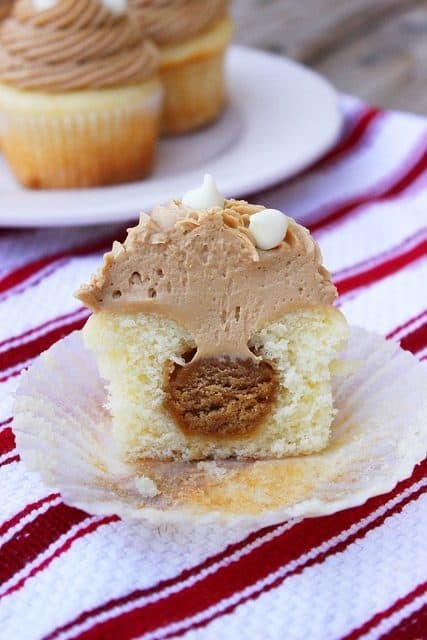 Add cookie butter and beat until ingredients are well combined and try to eliminate excess lumps. Next, slowly added sifted powdered sugar, about one cup at a time. Mixture will start to thicken, add vanilla extract and pumpkin pie spice and beat on a medium-high speed until all ingredients are well incorporated. Line a baking sheet with parchment paper. Roll the peanut butter into balls, about 2 teaspoons each. However large or small you make them will effect the total yield, but you should get between 40-50 buckeyes from this recipe. Freeze the peanut butter balls for at least 30 minutes. To prepare the chocolate, combine the chocolate chips and 2 tablespoons of vegetable shortening in a microwave-safe bowl. Melt in 30 second increments until you can stir it and it is free of lumps. If the mixture is still thick, add an additional tablespoon of shortening, and stir into chocolate until smooth. To dip the peanut butter balls, you have two options. You can stick a toothpick in the top and swirl it in the chocolate. Option 2 is that you can place a peanut butter ball on top of a fork and gently dip it into the chocolate. Tap the fork on the side of the bowl to drip off excess chocolate. Gently move the peanut butter ball onto a baking sheet lined with parchment paper. Dip in small batches, 5-7 a time, and keep the extra peanut butter balls in the freezer until you are ready to dip them. After they have been dipped, you can also place them in the refrigerator to help speed up the setting process. Chocolate should be completely firm. 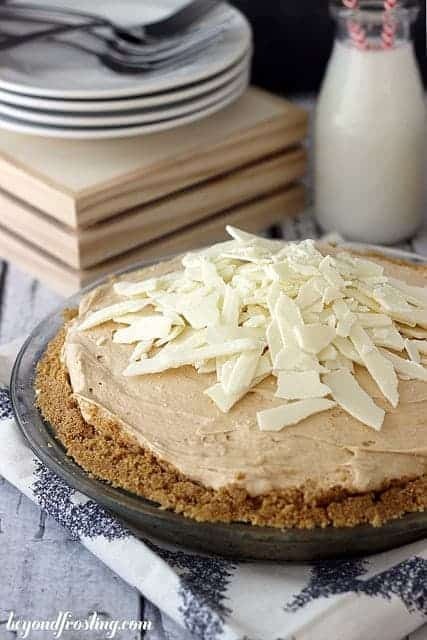 *If you are unable to get to Trader Joes, use regular cookie butter and add an additional to ½ to 1 teaspoon of pumpkin pie spice. 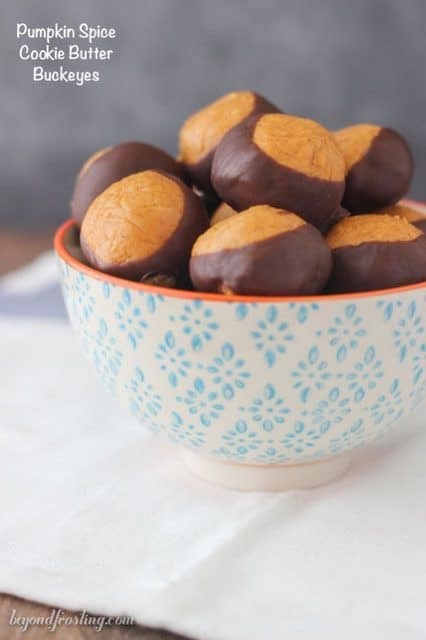 Buckeyes are absolutely a thing! Granted, I don’t think I ever heard of them until I decided to go to Ohio State for undergrad over a decade ago but they totally changed my life. My boyfriend likes to try to say they are just “peanut butter balls” but not when you leave the eye! I prefer them that way regardless because I am always in favor of a larger peanut butter to chocolate ratio. But I am also in favor of this pumpkin cookie butter version. 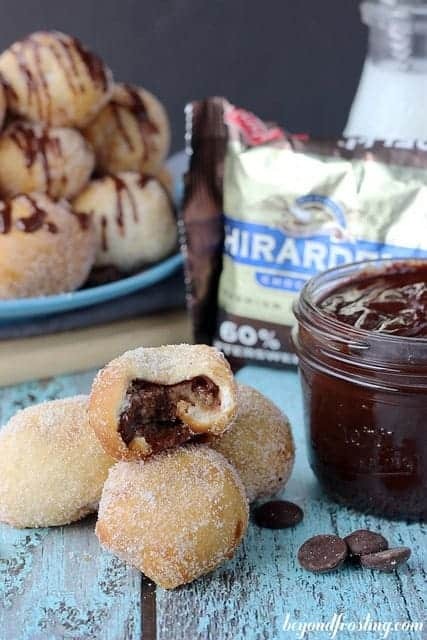 I must make them! I need to pop a few these down the hatch!